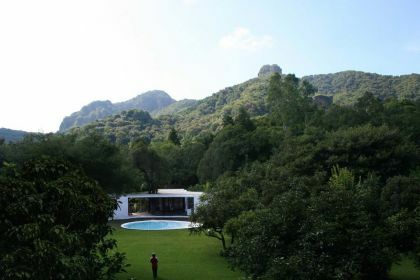 Tepoztlan, is a small town nestled between rocky cliffs located to the south of Mexico City, 50 kilometers away from the vibrant metropolis. 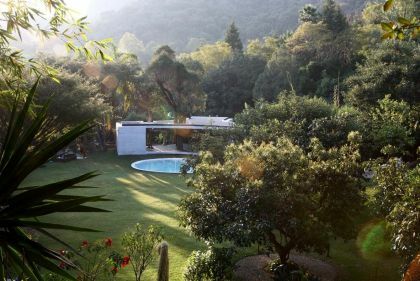 With its well preserved historic center and wild countryside, Tepoztlan is a town of legends and deep cultural roots that has been appreciated by writers, poets, artists and musicians over many decades, turning it into their hometown or weekend retreat. 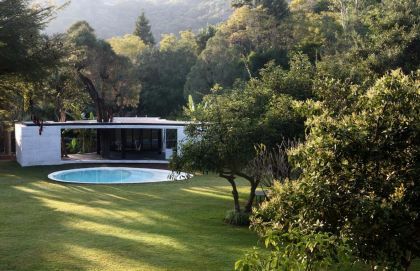 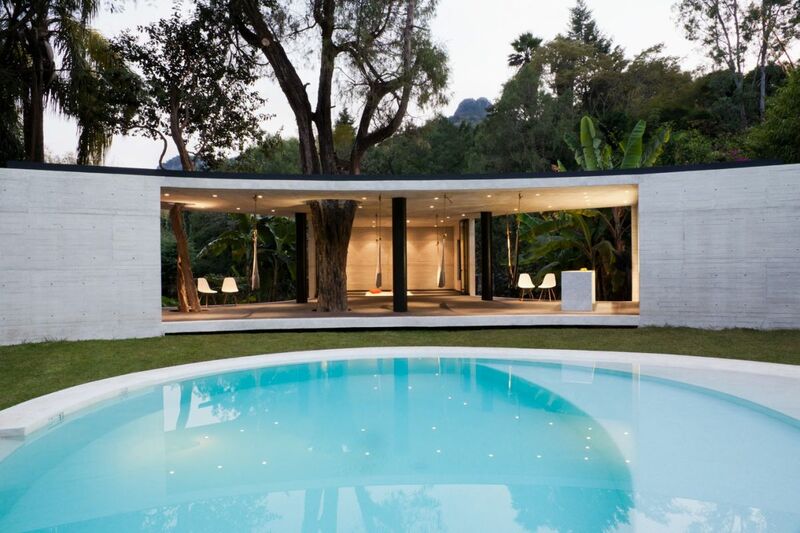 Located in this incredible context and surrounded by an astonishing landscape, the Tepoztlan Lounge is the first building completed of a larger project that also includes a series of bungalows of different sizes and designs, which can be rented by years, months or days. 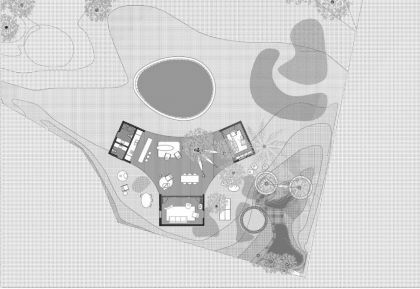 The lounge is set to be a central communal space for leisure in nature, and is located in the perimeter of an incredible lawn; the idiosyncrasy of the project relies on enabling the experience of the carefully manicured lawn while promoting the experience of the wild nature existing in the boundaries of this central space. 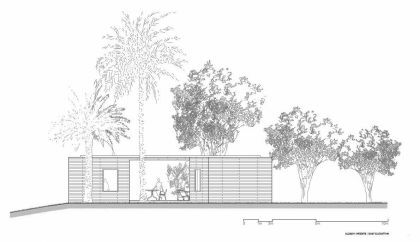 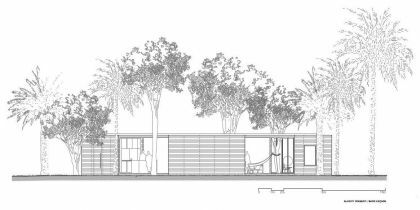 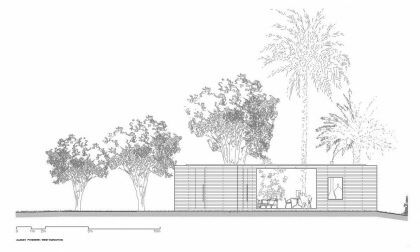 The project is a negotiation between interior and exterior, a construction of an in-between condition, an inhabitable threshold, which becomes the main space of the project; the limits between the open and the content space merge to produce a single architectural entity. 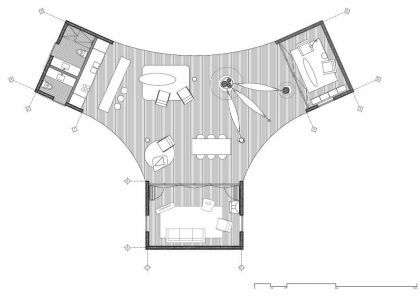 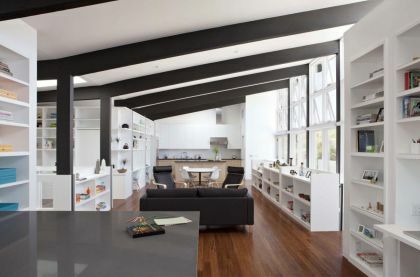 The design establishes three separate living quarters designed in accordance to the 3 activities planned; each of them is a set space defined by its use, but also by a very clear and simple architectural container: the first holds an open bar with a kitchenette, together with a couple of restrooms and dressing rooms; the second is a play area for children that can also be used as a reading room when temperatures drop at night; and finally the largest container is the living area, an enclosed, tempered and comfortable space for conversation, TV, etcetera. 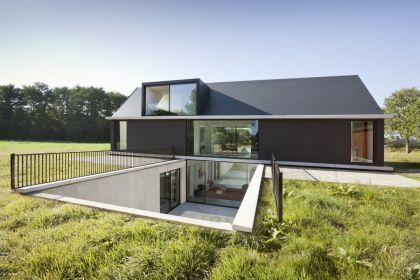 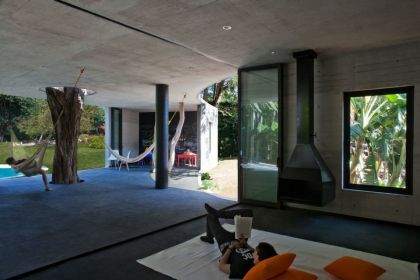 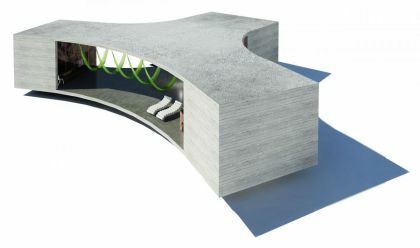 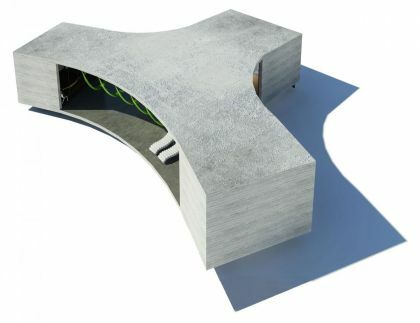 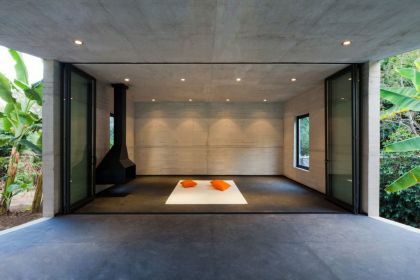 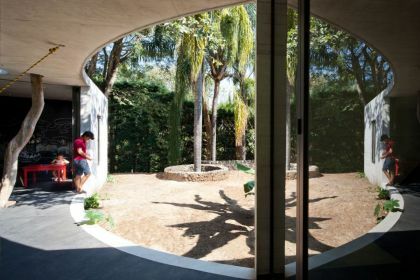 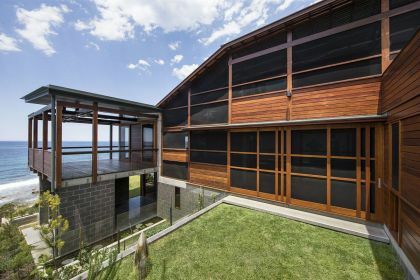 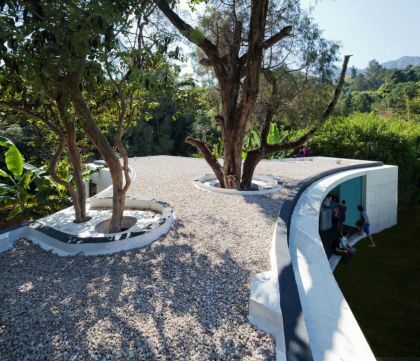 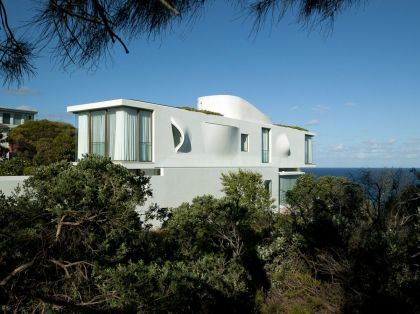 But it is the desire to give continuity between these three separate areas where the project is empowered and becomes meaningful; a continuous space, in full contact with the nature but protected from its inclemency is set up not only to expand the enclosed uses, but also to allow new activities to arise. 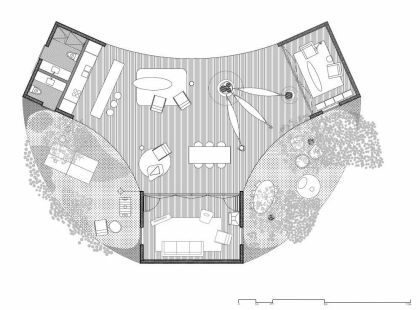 And it is through the definition of this central space, through the definition of its shape, that the contiguous courtyards are defined; those are as essential to the project as it is the built architecture, and allows constructing as a whole, single spatial experience. 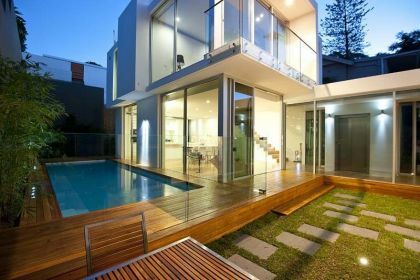 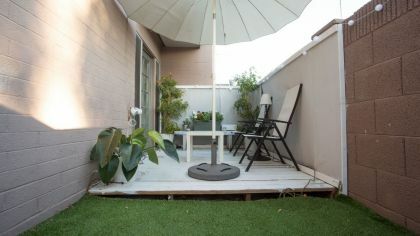 At the same time that the three built containers give continuity to the central space by mans of their use and space, the adjacent patios qualify it, while providing diversity and idiosyncrasy to open space. 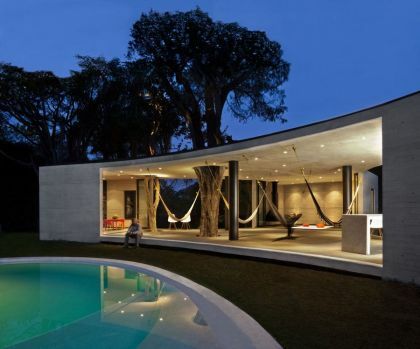 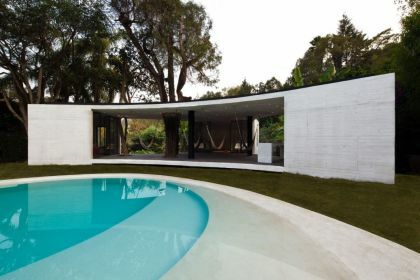 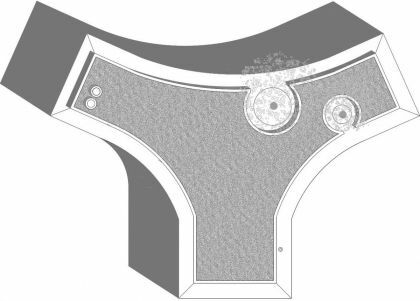 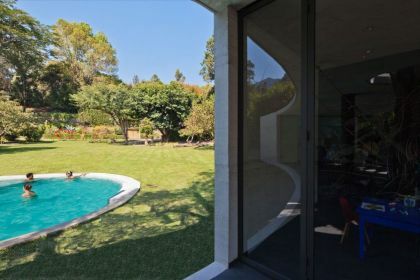 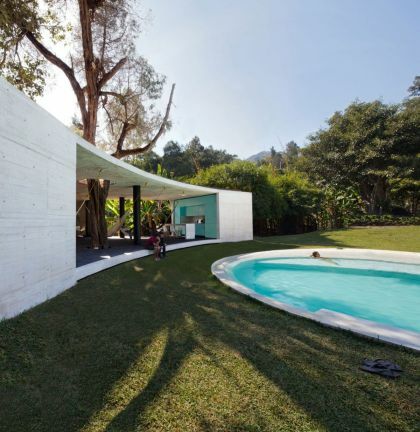 The design of the swimming pool is part of this same intervention, and responds to the desire to characterize the spaces; its formalization necessarily resonates the layout of the lounge, while incorporating to its nature the possibility of a multiplicity of ways of using water, and plunging on it. 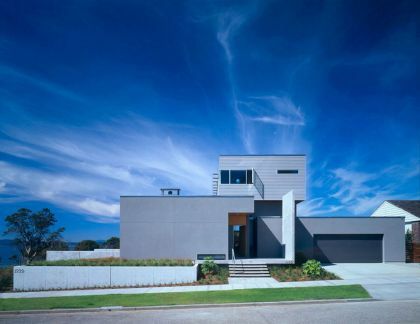 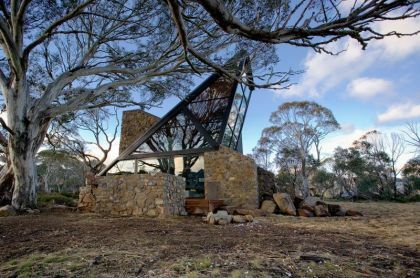 The building is located as a plinth valuing the views of the mountains. 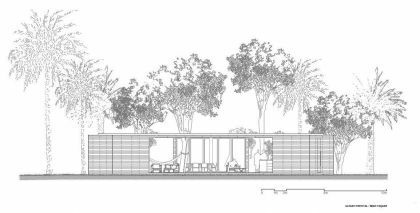 The building wants to be respectful to the existing context, and understands that the vegetation and life at open air are the real protagonist. 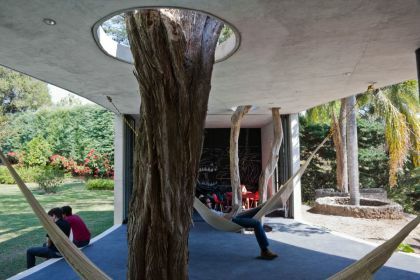 Two impressive trees that are in place are incorporated within the layout of the lounge, as if they were part of the program itself. 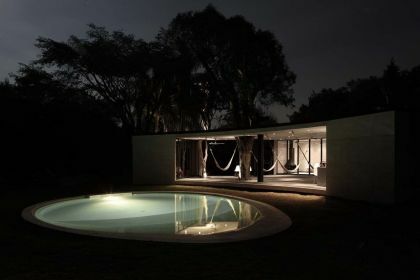 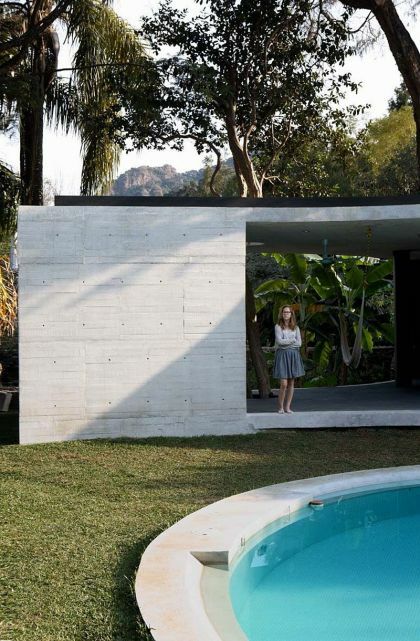 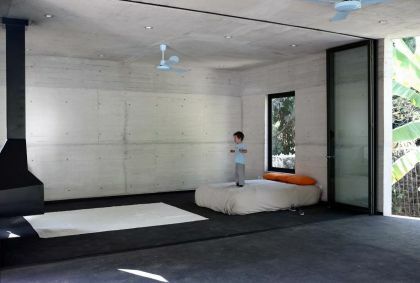 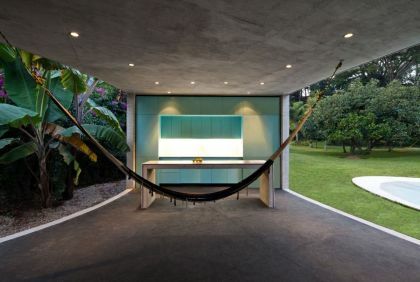 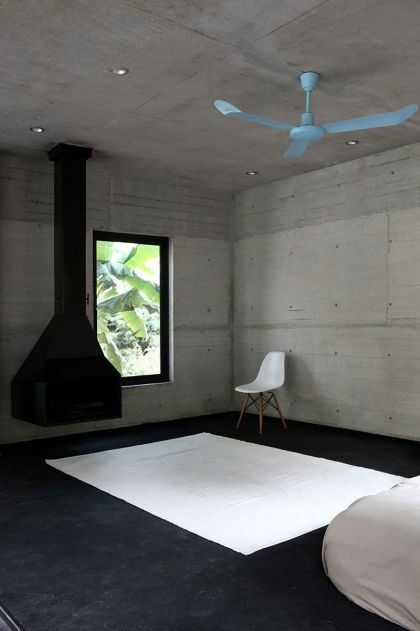 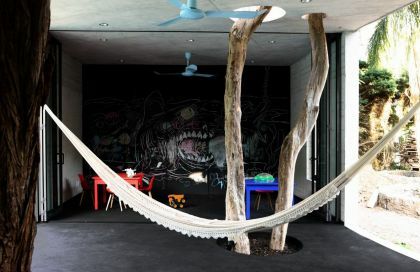 The Tepoztlan Lounge is constructed in concrete not just for being a inexpensive and labor intensive material in Mexico and to minimize its maintenance, but also to expose its structural simplicity and neutrality towards the astonishing nature. 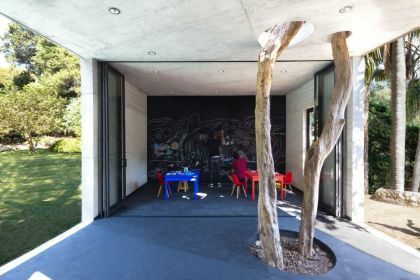 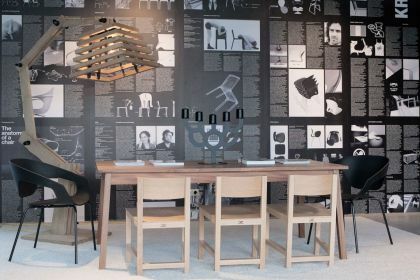 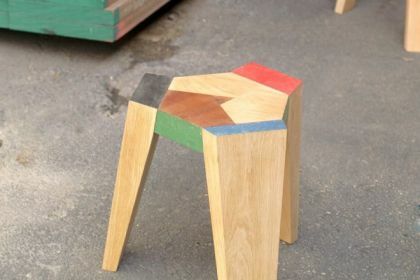 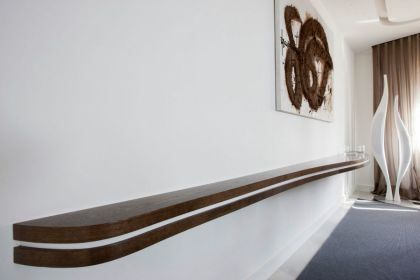 Description from the designer: the design of this 2-meter high object is based on the natural shapes of a tree and the exciting shadows coming through when the sun is shining.